Positioned along the banks of the New York waterfront, Buffalo's geographic location made it an economic hot spot for the railroad and grain industry during the early 20th century. By 1900, Buffalo was the largest grain-milling center in the country. Over a century later, several of the structures that played such an influential role during the city's early years have been deemed historic and can still be found across the region. The Buffalo Grain Silos, which are located along the riverfront and within clear view of the Buffalo Skyway, are one of the most highly visible historic structures the city has to offer. 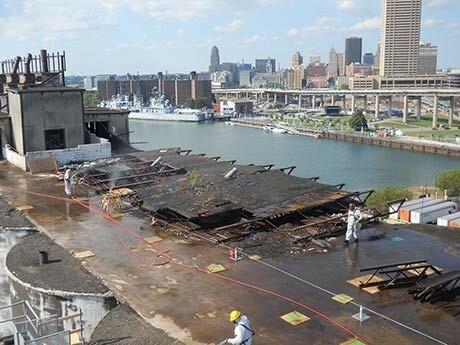 Given their proximity to the water as well as the surrounding public marina, it was determined that the failed roofing debris falling from the top of the silo structures was a hazard that needed to be addressed. Precision Environmental was brought in to provide abatement and material removal services on the high profile project. The Buffalo Grain Silos is comprised of 50 individual 120' tall concrete structures, making the project a complex, high risk job that few companies had the capabilities and experience to complete. The entire scope of work for Precision crews included asbestos abatement as well as the removal of failed roofing debris, transite panels, the concrete silo roof and the head house structure. Despite the challenges and hurdles involved with a project of this magnitude, Precision successfully completed their scope of work safely, on budget and within the aggressive schedule timeline. The abatement and debris cleanup of 50 individual 120 foot tall historic silos located along the Buffalo riverfront.